For readers who don't know, I'm the father of 3 young girls. This week I'll be discussing just a smattering of the weight bias teaching they're getting from the world around them. While I catch some of them, I'm sure there are many instances that I'm missing. I was excited when my sister-in-law gave us a copy of The Princess Bride. Like pretty much everyone, I adore the movie, and thought it would be great to read the book to my kids by their bedsides. I didn't make it through a single page. "The year that Buttercup was born, the most beautiful woman in the world was a French scullery maid named Annette. Annette worked in Paris for the Duke and Duchess de Guice and it did not escape the Duke's notice that someone extraordinary was polishing the pewter. The Duke's notice did not escape the Duchess either, who was not very beautiful and not very rich, but plenty smart. the Duchess set about studying Annette and shortly found her adversary's tragic flaw. Armed now, the Duchess set to work. The Palace de Guiche turned into a candy castle. Everywhere you looked, bonbons. There were piles of chocolate-covered mints in the drawing rooms, baskets of chocolate-covered nougats in the parlors. Annette never had a chance. Inside a season, she went from delicate to whopping, and the Duke never glanced in her direction without sad bewilderment clouding his eyes." 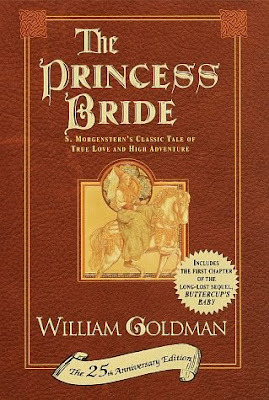 And so right out of the gate The Princess Bride is teaching kids that obesity is consequent to gluttony, and that gaining weight will lead people to find you unattractive and to never again glance in your direction. Perhaps the rest of the book leaves this creepy, older man leering, and simultaneously fat-shaming narrative behind, but frankly, after those first few paragraphs, I had no desire to find out. My advice? Stick with the movie.